Lucille Ball (1911-1989) was an American actress best known for her red hair and her impeccable comedic timing. She began work as a model, and later performed on Broadway. 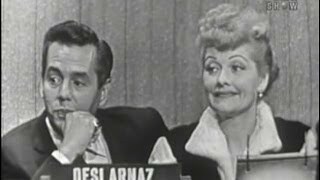 She had many small roles in "B-movies," before co-creating her television series "I Love Lucy" with her husband Desi Arnaz. She also ran Desilu, a television studio which filmed and produced many popular TV programs including Star Trek, Mission Impossible, The Andy Griffith Show, and The Jack Benny Program.